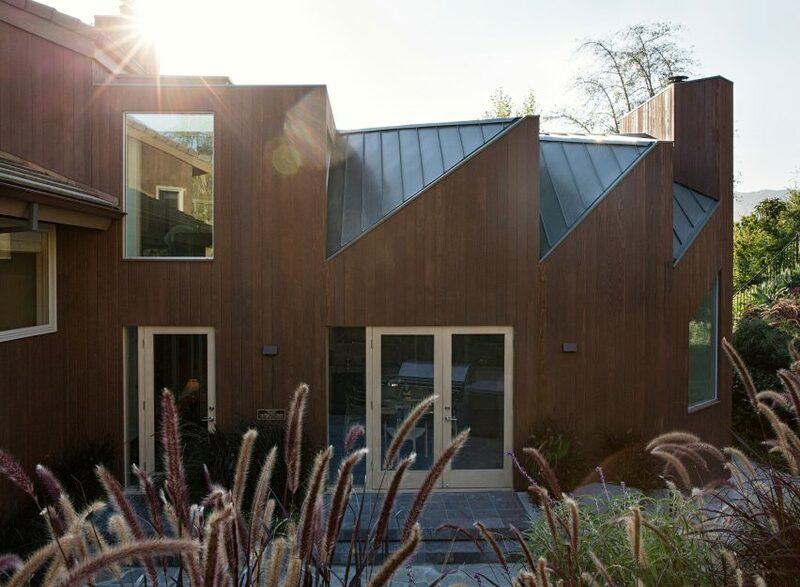 American designer Geoffrey von Oeyen has created a home office in southern California that features wooden exterior walls and a highly abstracted sawtooth roof. 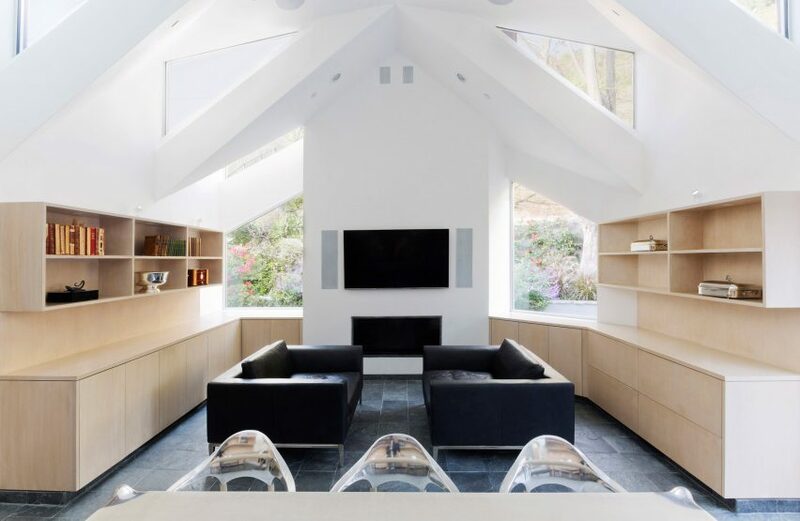 The project, called Case Room, entailed creating a home office for a pair of attorneys living in a two-storey, late-1980s dwelling in the beach city of Malibu. The couple wanted a satellite office where they could not only work privately, but also meet with clients and bring in staff. The extension was constructed at the rear of the L-shaped residence, in a spot formerly occupied by a patio. Rather than create a simple rectilinear volume, the design team took a sculptural approach. Encompassing 650 square feet (60 square metres), the addition was envisioned “as a series of blocks obliquely sliced and assembled in a descending sequence in section”, said designer Geoffrey von Oeyen in a statement. 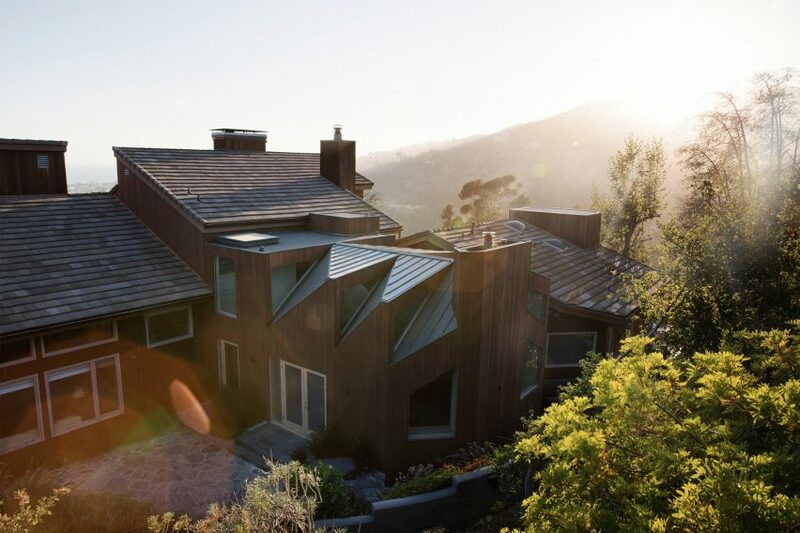 Von Oeyen, who formerly worked for Frank Gehry, runs an eponymous design and architectural practice in Los Angeles. 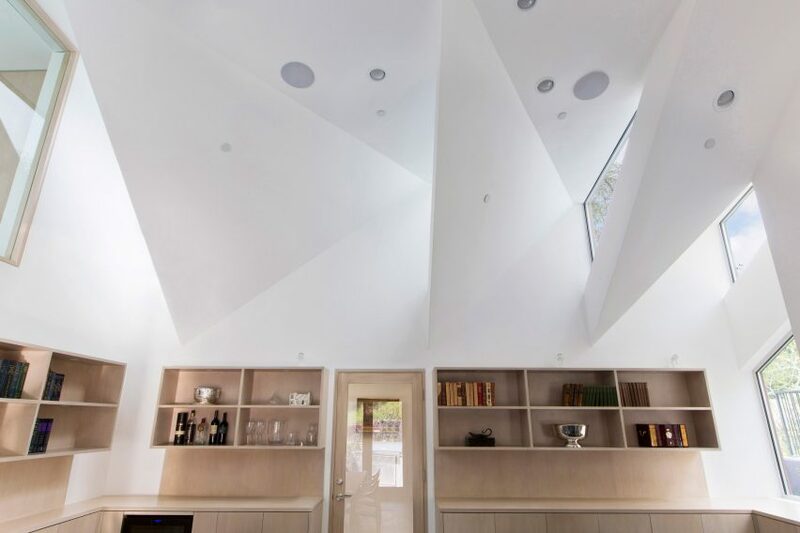 The extension is topped with an abstracted sawtooth roof, with angular cuts that vary in shape and size. “The serial, symmetrical roof gables, which step down one foot at each progression from the maximum city-defined height limit, align in plan with the major programmatic divisions of the space,” the designer said. 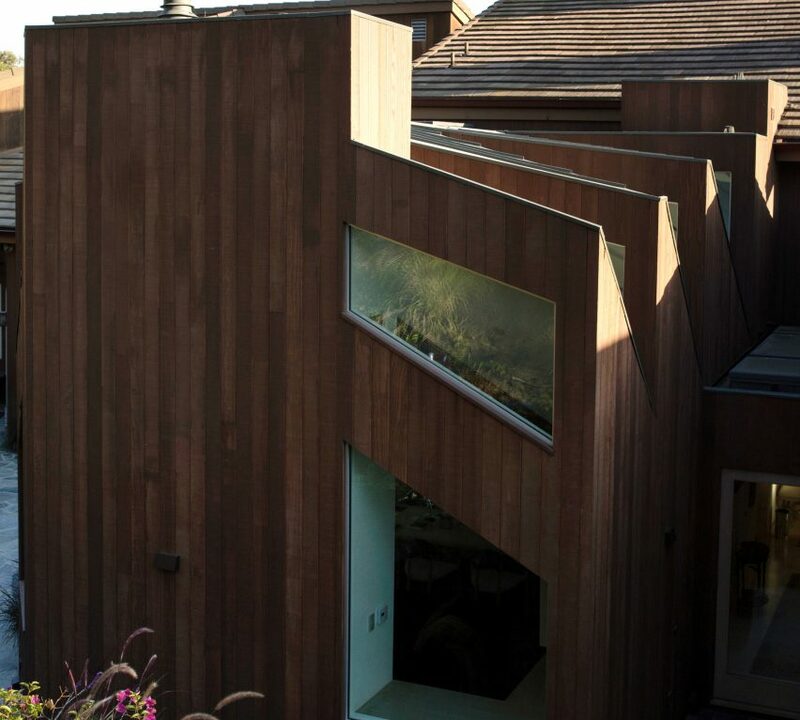 The new building is wrapped in dark-toned cedar, which mimics the redwood cladding on the existing dwelling. 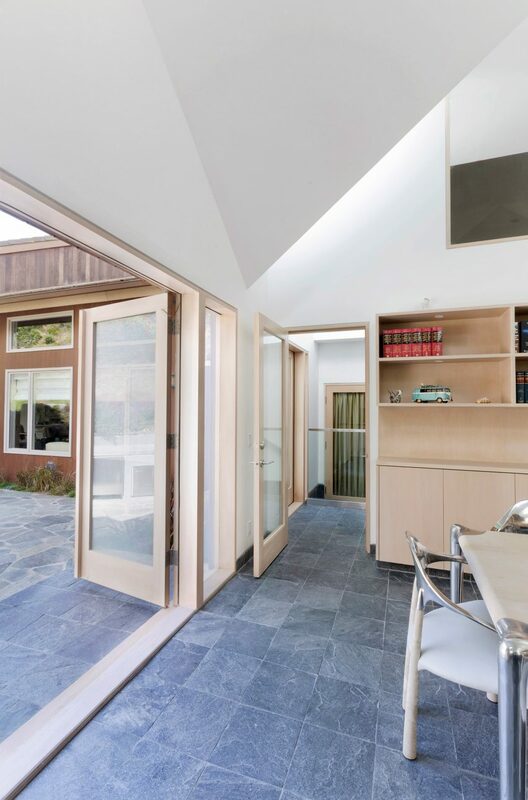 To separate the office from the home, the team constructed a skylit hallway on the west side, and created an entry vestibule on the south. The other sides of the addition face the backyard. 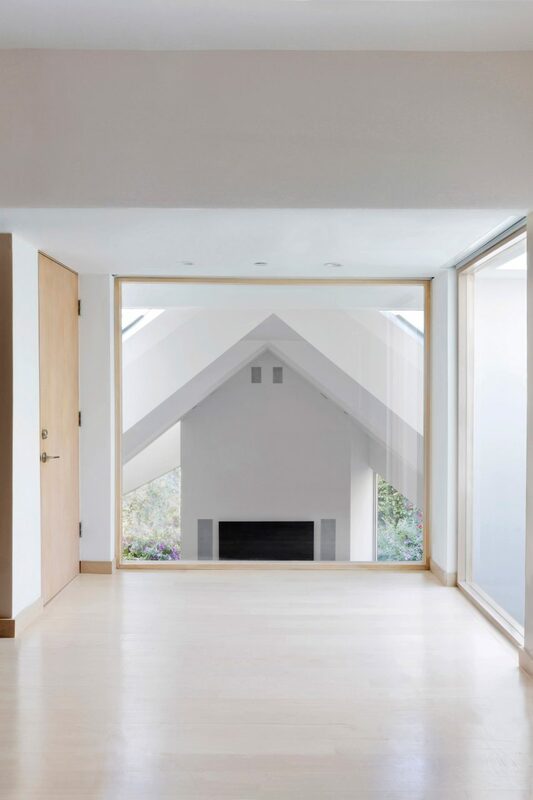 Inside, the extension contains a single room that is subtly divided into different programmatic areas. Occupying one side is a fireplace and sitting area, where the lawyers can meet with clients in a cosy setting. The sitting nook is surrounded by shelving and cabinetry. The other side of the room features shelves, a small kitchen area and a conference table that seats up to eight. Up above is a large window, which provides views into the office from an elevator landing and a media room on the second floor. The elevator, which was not required by the city, enables visitors with limited mobility to access the newly renovated media room. The team also created an outdoor zone for the office that overlooks the hilly landscape. “For daytime and evening events, a landscaped exterior patio with built-in benches, a fireplace, a fountain and an outdoor kitchen were added,” the studio said. The office is fitted with blonde wood, white walls and slate tile flooring. Numerous windows and wood-framed glass doors flood the double-height space with natural light. 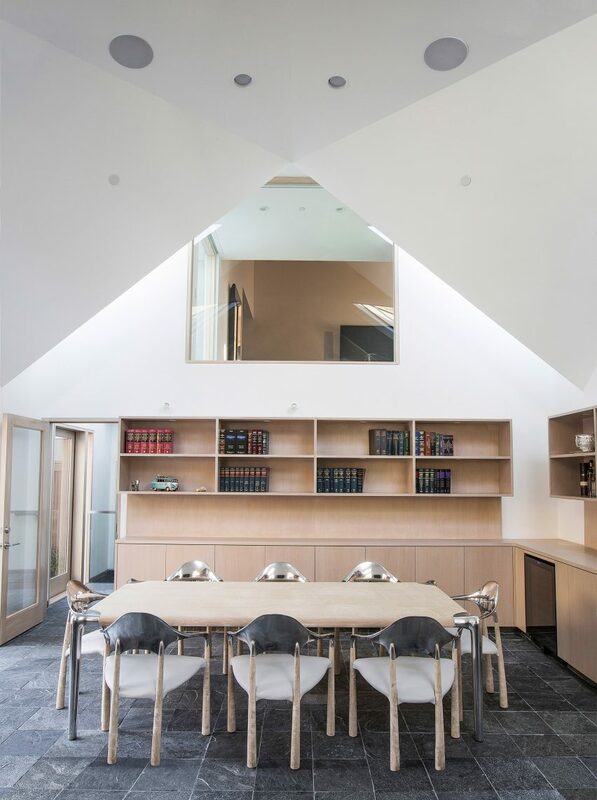 “The interplay of reflected daylight on the folding ceiling surfaces throughout the day provides a gently modulating, diffused top lighting for contemplative work,” the architect said. As work patterns have shifted in the 21st century, home offices and studios have become increasingly common. Others include a light-filled office by Matt Fajkus Architecture that was added to a mid-century dwelling in Austin, and an angular video studio by Modal Design that was added to a Venice Beach residence. Photography is by Kyle Monk.